3. Display - 5.5" on-cell IPS display, HD+ resolution, brightness, contrast, color temperature, sRGB coverage, etc. 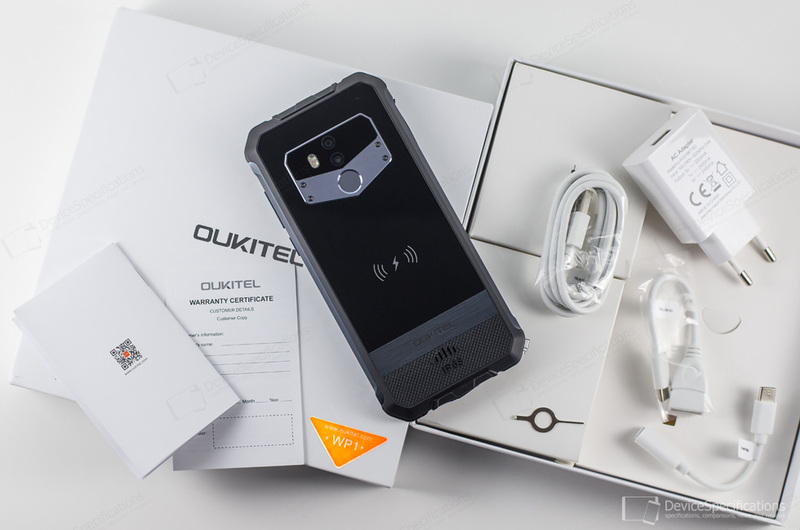 Oukitel WP1 has been released after Oukitel WP2 despite the fact that the WP2 is like a "Pro" version of the WP1. The smaller model retains the same ruggedized features of its sibling. However, it has twice as small a battery, a better chipset and a smaller display with a lower resolution. Hence, the WP1 will appeal to workers in harsh environments, sportsmen and great outdoors enthusiasts who are looking for an affordable ruggedized smartphone with reliable performance and battery autonomy. Let's begin with the specifications overview of the model. 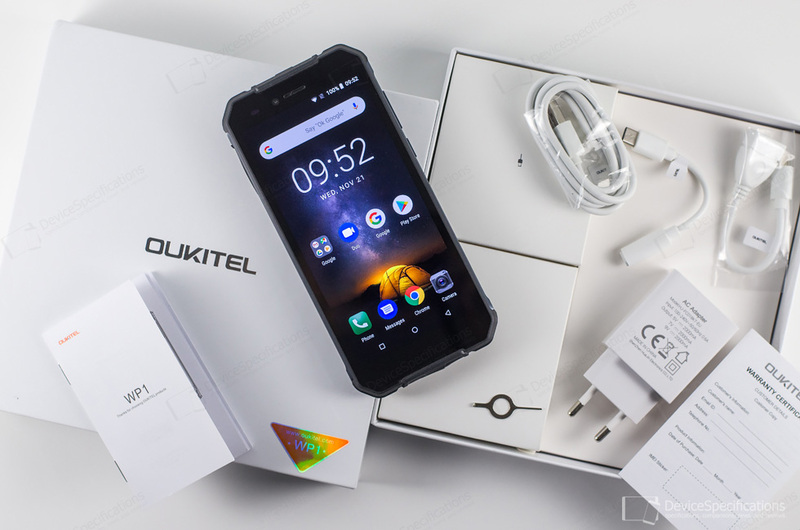 Our review unit is courtesy of Oukitel and you can buy it at a promotional price from Gearbest or from the Oukitel Global Store on AliExpress. Oukitel WP1 is built around a 5.5-inch IPS display with an HD+ resolution (720 x 1440 pixels). It has a classic rugged design and is IP68 rated for water and dust resistance. However, its back is made of glass making it possible for the device to support 10W wireless charging. Its battery has a capacity of 5000 mAh and is paired with a 5V/2A~7V/2A~9V/2A fast charger. Performance-wise, the model is based on a MediaTek Helio P23 in its downgraded MT6763V variant, in which the first cluster of four Cortex-A53 cores ticks at 2GHz and the second - at 1.5GHz. The graphics department is managed by a dual-core Mali-G71 MP2 GPU clocked at 700MHz. There are 4GB of double-channel LPDDR4X RAM on board, clocked at 1600MHz and 64GB of eMMC 5.1 storage, expandable with up to 128GB. The camera department features a 13MP Sony IMX135 primary shooter with an f/2.8 lens and a VGA GalaxyCore GC0310 auxiliary rear snapper. They are aided by a dual-LED flash. The front-facing shooter packs a 5MP GalaxyCore GC5025 sensor with an f/2.8 lens. The device supports 2G GSM (850, 900, 1800, 1900 MHz), 3G W-CDMA (900 MHz, 2100 MHz), and 4G FDD-LTE (800, 900, 1800, 2100, 2600) networks. LTE speeds are Cat. 6 ones and simultaneous 4G on both SIM cards is supported. The wireless connectivity options of the Oukitel WP1 include Bluetooth 4.2, dual-band Wi-Fi 802.11 a/b/g/n, Wi-Fi Direct, Wi-Fi Hotspot, Wi-Fi Display. The smartphone works with GPS and is equipped with a USB Type-C 2.0 port and a rear-mounted fingerprint sensor. No 3.5 mm jack. The model runs on Android 8.1 Oreo.